I decided that this would be a good weekend to spend in NH. There wasn’t really much going on in Boston, so I headed home. I started my day on Saturday in Boston with a run and a crazy BG drop (but I didn’t go low), then drove up for the University of Oregon vs. Oregon State Civil War football game. I enjoyed good food, good company, and a great game with my parents and some friends. On Sunday, I helped my mother decorate the house, and we went to pick out a Christmas tree, and we watched Eloise, and then we baked cookies. We started with the gingerbread cookies, and then moved onto sugar cookies. The child in me jumped at the opportunity for the sugar cookies because I got to use all the cookie cutters. I made snowmen, santas, candy canes, bells and nutcrackers. As a kid, my two most favorites were a large bell and large snowman. They were my favorite because Mom would make a special exception for me to be able to eat those, even though it was closer to three starches. They are the simplist of our cookie cutters, but they were mine. And I could only make one of each. As I compared them to our new cookie cutters, with fancy decorations, the “large” bell and snowman don’t seem so large anymore. I mentioned this to my mother, and she remembers this too. It seemed a little crazy to both of us. We kept on going though, but I still marvel at how big our cookies are. And of course, the projected carb count/starches are running through my mind. 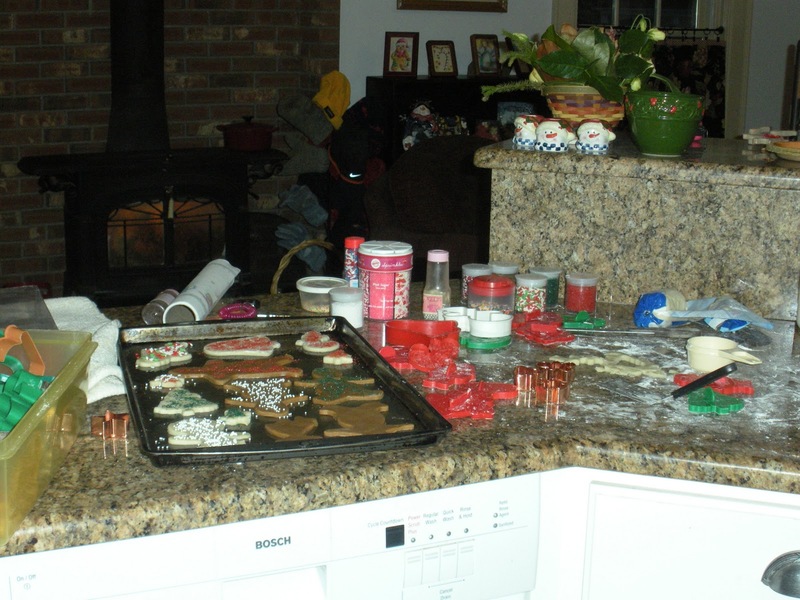 Along with, “how did she manage to give me a cookie worth 3 starches?” We were almost ready to bake them, and we got out the sugar and sprinkles and other fun decorations. I went to town with red and greens and whites and combos of all the above. (I don’t use the silver balls anymore though, because what’s the point of decorating a cookie with something you’re not supposed to eat?) I kept some cookies free for my father though, since he doesn’t have a sweet tooth. And then mom says, “do you want me to make some frosting?” As a kid, I can remember wanting frosting on the cookies more than anything else in the world. But we never used frosting. With the tennis team in college, we decorated cookies and mine were so intricate. I didn’t even notice. Everyone else did, and when they mentioned it to me, all I could say was “I’ve never been able to decorate with frosting before.” So mom makes her frosting and she gets out her fancy frosting thing-a-ma-bobber and I start to decorate. After a while, I’m sick of it, so we add red food coloring and then the rest green. I’ve never been a marathon cookie maker, so after a while, I turn to mom and have her finish them. As she’s loading the last onto the drying rack, she says, “you know, we never did this when you were little.” “Yea, that darn diabetes and starches got in the way.” Our cookie baking tradition continues, but now we get to make them even better.